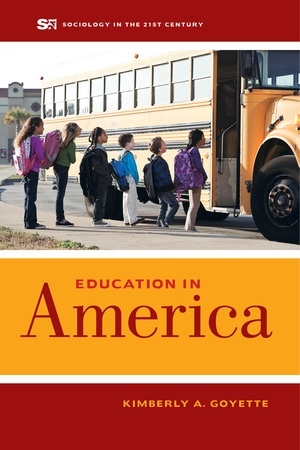 Education in America provides an essential, comprehensive introduction to education in the U.S., from its origins to its contemporary manifestations. Focusing on social inequality, Kimberly A. Goyette calls into question Horace Mann’s famous proclamation that education is the “great equalizer” and examines how education stratifies students based on socioeconomic background, race, and gender. She identifies the 'hidden curriculum' beneath equations and grammar rules, from which students may learn what is expected of them based on their anticipated roles in society. Referencing school reforms such as No Child Left Behind, Race to the Top, and Common Core, Goyette shows that education is not merely reflective of a society’s views, but instrumental in shaping and changing society’s structure. The Sociology in the Twenty-First Century Series introduces students to a range of sociological issues of broad interest in the United States today, with each volume addressing topics such as family, race, immigration, gender, education, and social inequality. These books—intended for classroom use—will highlight findings from current, rigorous research and demographic data while including stories about people’s experiences to illustrate major themes in an accessible manner. Learn more at The Sociology in the Twenty-First Century Series. Kimberly A. Goyette is Professor and Chair in the Department of Sociology at Temple University and specializes in the Sociology of Education.